Having a big brunch is good. Enjoying it on a Sunday is better. Indulging on a bigger and better Sunday brunch is best—and this is served only at Marriot Café. So, why choose when you can have the best of both worlds? Upon entrance at the five star restaurant buffet, patrons can immediately recognize the new arrangement and some new containers of its fabulous food and bevy of beverages. Each section is harmoniously organized to attract your eyes and fill your appetite. And with the welcome additions to the menu, everything is truly Bigger and Better for Sunday brunch! On the right side, the amazing spread of cold cuts, cheeses, and freshly-baked breads are complemented by a variety of nuts, raisins, and jams. Together, they provide a wonderful and welcoming sight. On the left side is a pleasant surprise. Since Thai food is a global favorite, Marriott Café now offers Thai Red Curry, one of Thailand’s most globally recognized dishes. You can make your own piping hot bowl by filling it with your preferred amount of red chillies, cilantro, coriander, cumin, garlic, shallots, kaffir lime, galangal, and lemongrass. After enjoying that spicy kick in your taste buds, fresh tropical fruits and gallons of gelatos in various flavors are also available. Love these new and numerous offerings so far? The feast of the Bigger and Better Sunday Brunch continues with the farm to table produce which highlights the delightful array of salad supplied by Bautista Organica Farm. Its dressings and other toppings make the salad station a favorite go-to place of those who want to stay healthy and at the same time support sustainability. 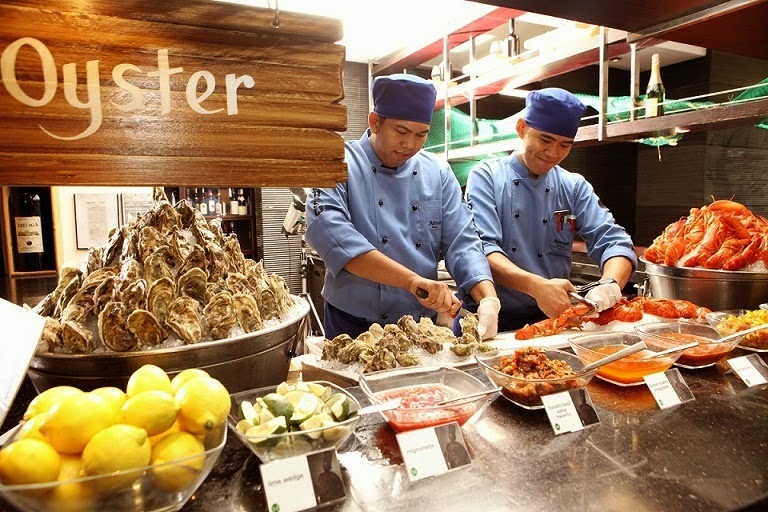 And since buffet dining is always a pleasure at Marriott Café, it now offers unlimited Fine de Claire Oysters and Boston lobsters that are imported from France. There’s a gamut of condiments to pair them with like soy and sesame, mango salsa, tomato basil salsa, cocktail sauce, lemon shallot vinaigrette, mignonette, lime wedge, lemon wedge, lemon and butter, or beurre blanc. Crustacean lovers can literally say cheers to that—because Marriott Hotel Manila is also throwing in unlimited champagne! Foie gras with its various jams and compotes as well as the succulent steaks are also a perennial favorite at Cru Steakhouse. While chefs are heating up the grill and the flames are all ablaze for these orders, a medley of meats and seafood’s are presented like rib eye, crabs, shrimps, and other fresh fishes. Even the Chocolate Room has offered new desserts served in shooter glass like the Strawberry Jelly and the Chocolate and Mango Mousse. Those who fancy local desserts will surely love the Leche Flan garnished with macapuno strips as well as the Macapuno Tart because it’s brimming with custard in every bite. The martini station keeps everyone merry while others can’t help but come back to have more pastas at the pasta station; sushis, sashimis, and other teppanyaki fare at the Japanese station; and a selection of soups to sip and savor. For only P2,500 nett, you can enjoy both quality and quantity to your heart’s content. The Bigger and Better Sunday Brunch at Marriott Café runs every Sunday from 1130am-3pm.